Being a family-friendly hotel means more than having rooms configured for children and restaurants with kids’ menus. All of which Novotel Bangkok Ploenchit Sukhumvit certainly has. 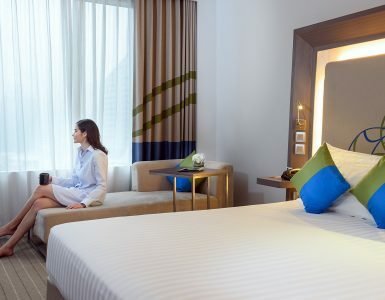 But to be a truly family hotel in Bangkok, we provide the kinds of facilities, amenities and local attractions that make kids – and moms and dads – happy throughout their stay. Novotel already is known worldwide as one of the best hotel choices for families. No surprise, then, Novotel Bangkok Ploenchit Sukhumvit is an ideal family hotel in Bangkok. We have everything needed to ensure quality family time during your holiday. At Novotel Bangkok Ploenchit Sukhumvit, children under 16 years old stay for free (when using existing bedding). If your room includes breakfast, children automatically get free breakfast. We allow maximum upto 2 children. Parents don’t have to worry about keeping the kids entertained. Our Kids’ Corner at lobby level is open 24 hours every day and is especially suitable for small children. Our Kids’ Play Room is available during weekend dinner and Sunday brunch and offers lots of fun games and activities. Kids love making a splash too, of course, and they can do that at our outdoor swimming pool with kids’ area. Counting among many helpful amenities at Novotel Bangkok Ploenchit Sukhumvit is professional babysitting service available on request. Our location puts you nearby many of Bangkok’s most popular children attractions, all easily reached via BTS SkyTrain. KidZania at Siam Paragon mall comprises a miniature town where kids role-play various careers such as nurse, firefighter and chef. At TK Park (Thailand Knowledge Park) within CentralWorld mall at Chidlom station, kids and parents can enjoy browsing a modern multimedia library. Dinosaur Planet at EmQuartier near Prompong station is an exciting theme park featuring rides, interactive games and educational exhibits. 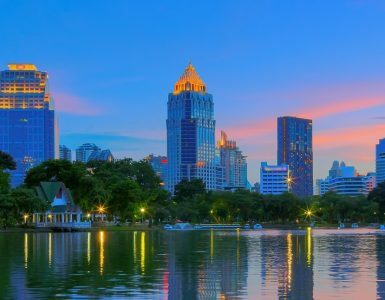 So if you’re looking for a family hotel in Bangkok, Novotel Bangkok Ploenchit Sukhumvit has it all: fun for the kids and peace of mind for parents.